Does your work involve caring for or supporting others? 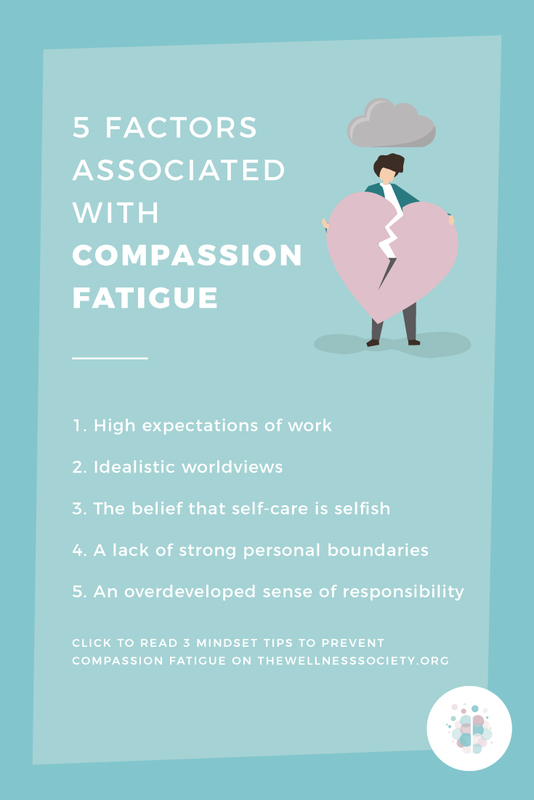 If you’re frequently exposed to other's suffering, you may be at risk of experiencing compassion fatigue (CF), a.k.a. secondary traumatic stress (STS). 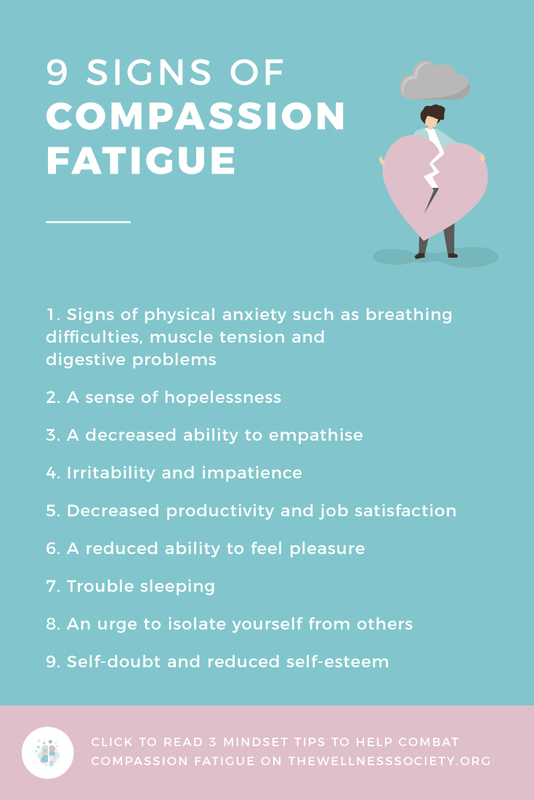 If you think you might be experiencing compassion fatigue, you can take the Professional Quality of Life Scale Screening test (PROQOL) – it’s available to download for free here. 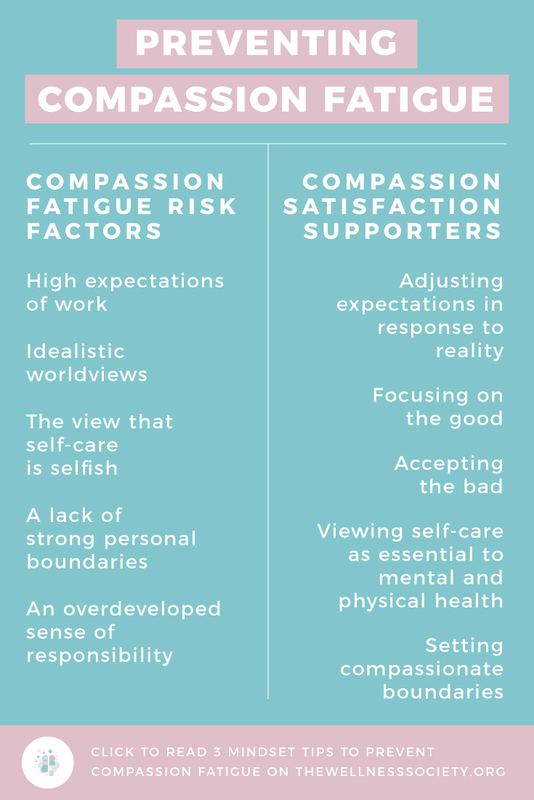 It’s important to note that compassion fatigue is a normal human response commonly seen in highly empathetic individuals. It isn’t a disease or illness. It’s a temporary state—a spectrum—that you can shift further out of. 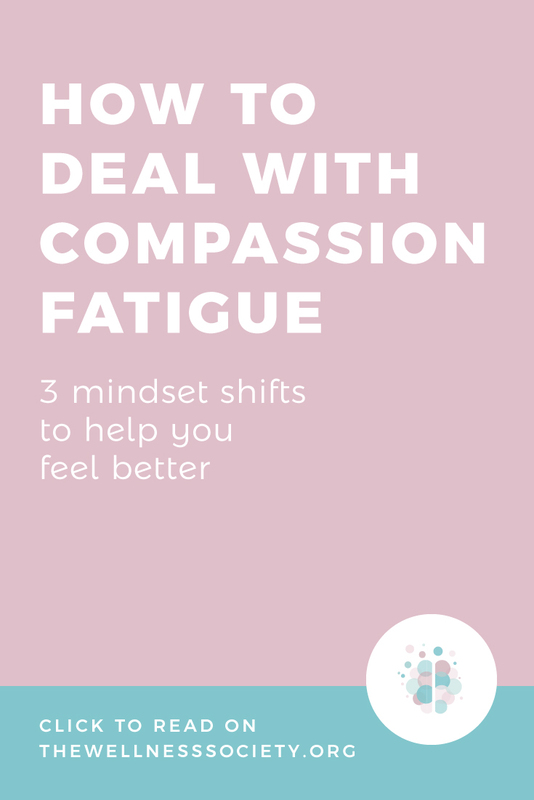 So, how can you deal with compassion fatigue? Your mindset plays a big role in your susceptibility to this phenomenon. With the above in mind, here are three mindset shifts you can make to better protect yourself. Many helping professionals are drawn to their jobs due to their strong desire to make a difference. Sadly, this can be met with a sense of disillusionment and hopelessness once people are exposed to high levels of tragedy and suffering over which they have little control over. How much time do you spend ruminating—i.e., getting stuck in thought loops—about things you have little control over? The highly empathetic, passionate and sensitive people susceptible to compassion fatigue often feel as though they’re carrying the whole weight of the world on their shoulders, and letting go of this overdeveloped sense of responsibility can be truly life-changing. This weighty load is not yours alone to carry! Suffering is—and always will be—universal. This fact is the primary tenet of Buddhism (which we argue is a highly practical philosophy for mental wellbeing!). The first noble truth is that suffering, dissatisfaction, and imperfection (“dukkha”) are all around us. Developing mental resilience is how we handle this difficult fact of life. Mental resilience is reminding ourselves that positive outcomes are not always achievable. It’s accepting our human limitations and letting go of perfectionism. It’s reframing thoughts and situations in the most helpful way possible. It’s seeing the good by not overlooking the “small” ways in which we help every single day, just by being there, offering a listening ear, and reminding vulnerable clients that caring people exist. When you focus on developing your mental resilience, you make space for what’s called ‘compassion satisfaction’, the feeling of joy and contentment you get from making a difference. Helping-oriented people often view self-care as a form of self-indulgence. The idea of focusing on themselves makes them feel self-centered, selfish and fills them with shame. This view of self-care is a hazard to your health. It’s worth repeating: the view that self-care is selfish is a serious health hazard. We urge you to realise this before it’s too late. 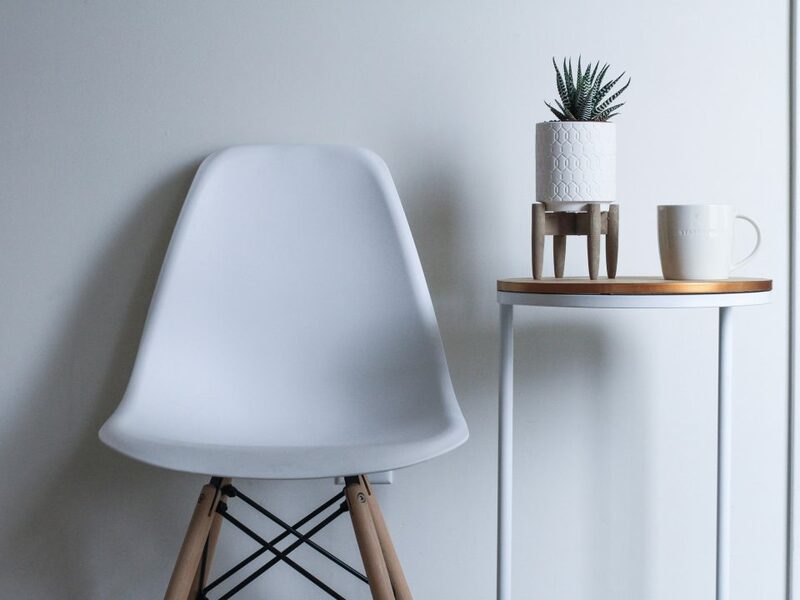 The phrase “self-care” has become incredibly popular recently; you may find it a trite expression. But let’s not forget what it means: taking care of your mental and physical needs. 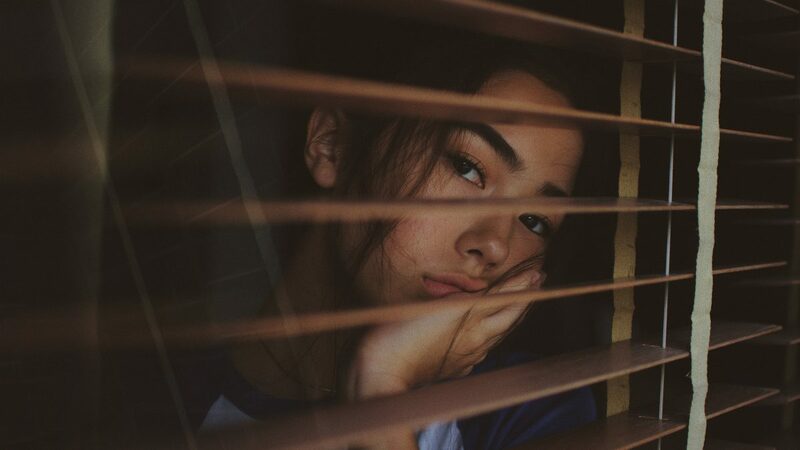 The body keeps the score when it comes to stress, and self-care is your way of protecting yourself against the dangers of poor mental wellbeing. Self-care goes hand in hand with stress-awareness; the more stressed you are, the more self-care you need to recover. This is easier said than done because we often have more awareness of our stress triggers than our signs of stress. 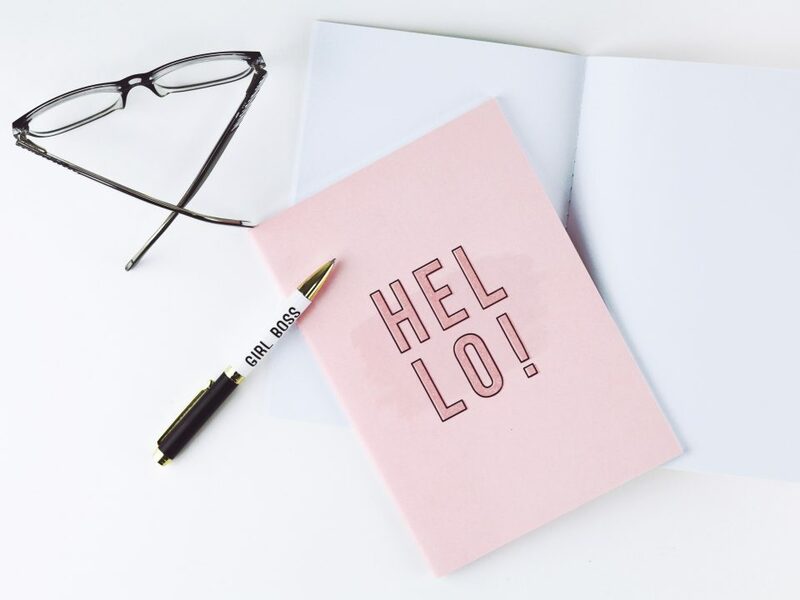 Think you could benefit from getting on top of your stress and self-care? We can help! 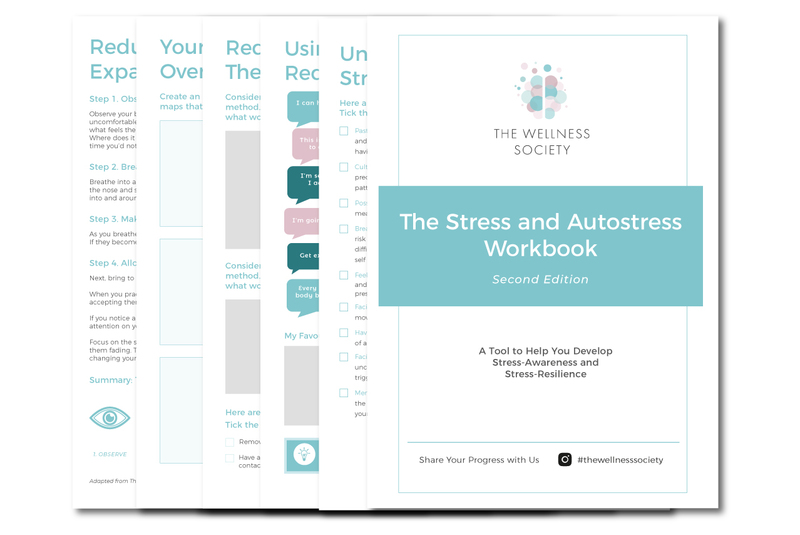 Check out our Stress and Autostress Workbook – a powerful self-help workbook to help you develop stress-awareness and stress-resilience. 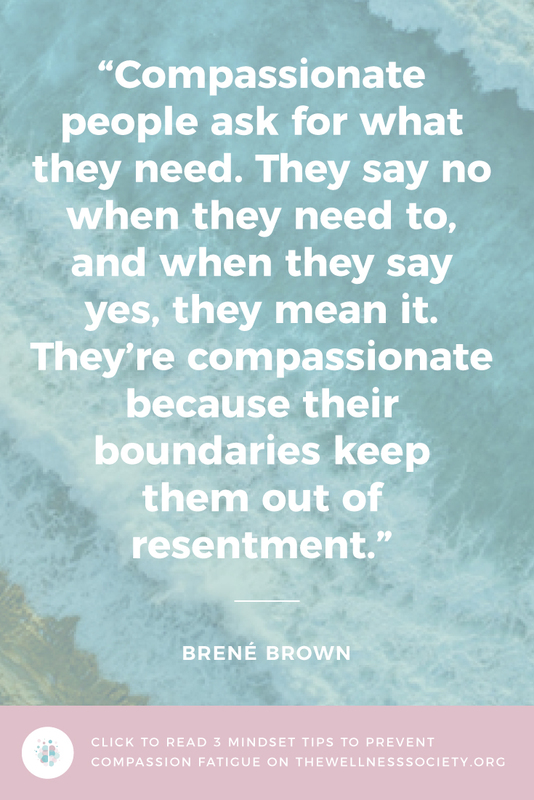 Compassionate boundary setting involves deciding what you will and won’t accept for your wellbeing, and it’s a skill you can get better at over time. When you notice you’re getting carried away by negative thoughts and emotions, observe what you’re experiencing and assess how you can best take care of yourself. Remember: preventing yourself from becoming overly involved in other people’s suffering allows you to engage in sustainable, effective and rewarding work. 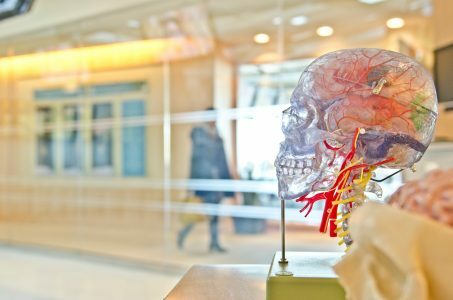 When you notice your mood being deeply affected by another person’s suffering, it’s okay to reduce its impact on you by using cognitive distraction techniques. This isn’t about avoiding your emotions around the situation; it’s a way to allow your emotions to defuse naturally, so they don’t immediately spiral out of control. 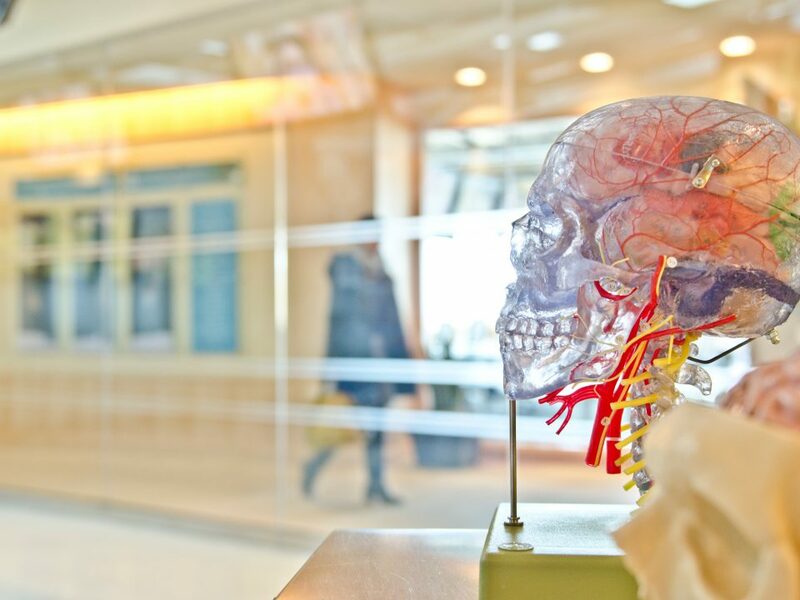 Find out some ideas for cognitive distraction methods here. As mentioned earlier, part of developing your mental resilience skills involves being able to reframe thoughts and situations in the most helpful way possible. Want to improve your cognitive restructuring skills? Cognitive restructuring is a powerful self-help method for mental wellbeing. Learn the common cognitive distortions and examples on how to restructure them here. Take a step back by experimenting with coping statements that help you feel better. 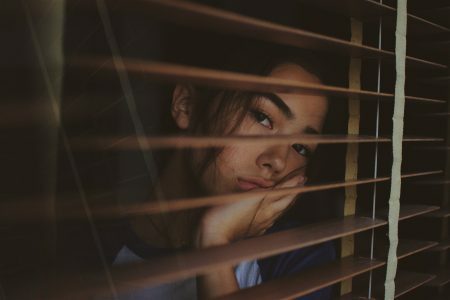 If you find yourself taking home all of the worries and concerns from the day, try completing the Worry Time exercise developed by Robert Leahy, author of The Worry Cure. This exercise involves regularly allocating a specific time of day to reflect on your worries. Over time, it can help you reduce worry and better compartmentalise your work and personal life. 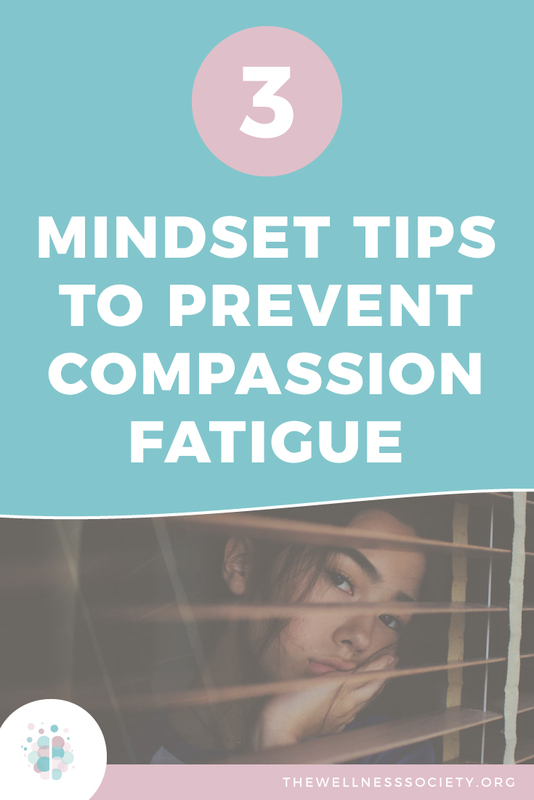 If you’re struggling with compassion fatigue, it’s important to share how you’re feeling with your supervisor. Ask them what reasonable adjustments they could make to help support your mental health and prevent it from deteriorating further. 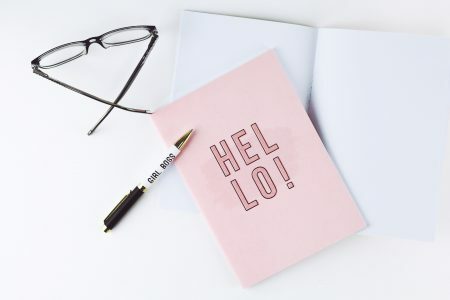 They may refer you to your Employee Assistance Programme (EAP) or encourage you to explore accessing therapy. When you’re so focused on serving others (as those susceptible to compassion fatigue are), saying no can feel hellish at first. However, those who care for you and respect you will accept your need to step back. Every time you say no when you’re overstretched, you’re honoring your needs and protecting your wellbeing.